Ok. I have no idea of there are Real Professional Researchers out there who are noting similarities of pieces held among far flung collections, but as you can see – the subject continues to fascinate me as an dilettante. Trust me – if readers here are willing to sit still for them, I’ve got a ton more examples to share. This set is is more difficult to show, in part because the Hermitage Museum has taken down one of the two artifact pages dedicated to two associated cutwork pieces, accession numbers T-8043 and T-8045. The second depicted the castle that I graphed, below. The last time I saw the source artifact at the museum’s website was in November 2014, but the castle can no longer be found from my saved links, or via searches on its name or accession number. You can find a full-size version of the chart above under the Embroidery Patterns tab at the top of this page. There were small fragments of partial designs underneath the castle in T-8045 that associated it with this this other Hermitage artifact (T-8043). This one shows a boat with passengers, several happy fish, and a pair of rather blocky lions. The photo below is credited to their official artifact page for T-8043, where it is attributed to Italy, from the late 16th-17th century. They call it “Embroidery over drawn thread”. And here’s the cousin of the Hermitage artifacts: a VERY similar – that’s similar, not “same” – fragment from the Philadelphia Museum of Art, Accession #1939-9-1. 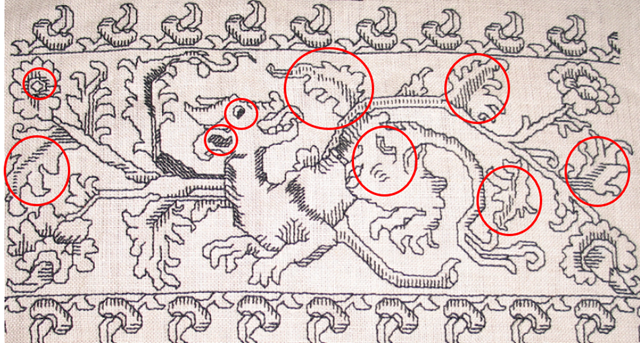 PMA calls out the piece as being 16th century, Italian, done in linen cutwork and drawnwork. As far as acquisition time frames, the Hermitage samples come from the same Stieglitz Museum source as the other Hermitage embroidery sample I discussed last week. The Philadelphia Museum of Art came by its piece in 1939, as a gift from Mrs. Frank Thorne Patterson (a noted collector of the time). Now, the Philadelphia example is a truncated photo of a fragment, and has borders that the Hermitage samples lacked (you’ll have to take my word on the castle original), but in technique, composition and subject matter it’s very, very close. It has the bottom edge of what is clearly almost the same castle as the one I graphed, plus a boat, manned by curious, full skirted figures, and some similar birds. Yes, there are small differences in detail in the boat’s ornaments and passengers, plus motifs on each piece that do not appear on the other, but I believe these artifacts do like they might be from the same workshop. Obviously, to prove this assertion we’d need some sort of detailed fiber analysis – much more than my casual observations. Any grad students out there need a project? Keep tuned for more episodes of Embroidery Family Reunion! I’ve long been been fascinated by one type of pattern that shows up in a couple of modelbooks. It’s a strip design, done positive/negative, such that cutting down the center line would yield double yardage of the repeating motif. Here are some examples, quoted from Kathryn Goodwyn’s redacted editions of Giovanni Ostaus, La Ver Perfettione del Disegno, from 1561 and 1567. I have tried to use this technique myself, with very unsatisfying results due to the stretchy nature of the unsuitable fabric I was using, lack of sufficient stabilizer, and imprecise cutting. But I’ve finally found a historical example, and it’s pretty close to one of the Ostaeus 1561 designs – amusingly enough, the exact one I tried and failed so badly to use. Band, 17th century; silk, metallic thread; Bequest of Marian Hague; Cooper Hewitt, Accession 1971-50-47. As to technique on the CH band – it works just as I envisioned. This is velvet, carefully cut and appliqued to a ground, with the cut edges covered by a couched heavy metallic thread. You have to admire the efficiency of this method; not a scrap of that green fabric was wasted. So. Has anyone seen other examples? Has anyone attempted the technique, either in fabric as shown here or (probably easier) glovers’ type very thin real or faux leather? Why were these cut apart? I suspect that the European dealers who sold antique lace and stitching in the latter part of the 1800s and early 1900s were more interested in maximizing profits than in preserving artifact integrity. It’s an unusual piece, combining linear stitching and satin stitching, plus a detached buttonhole insertion to attach it to whatever it originally trimmed. AIC calls out the stitches used as being back stitch, hem, satin, and split. MFA calls them line stitch (one of their names for double-running), chain stitch and laid work. 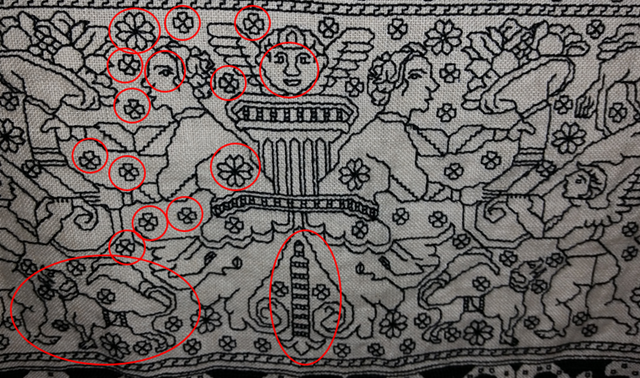 Personally, I do not put much stock in museum stitch descriptions because so many of them have not been revisited since original acquisition, and so many are idiosyncratic. Without seeing the reverse, I’d posit double running or back stitch (back can look like split or chain on the reverse), and satin stitch. But however these pieces were done, differences are minute (a couple of zig-zag branches in the column headers) – it’s pretty clear to me that they were once part of the same source artifact, possibly two ends of the same cloth or towel. Here’s another pair. We lead off the the MFA’s Accession 09.38, sadly blessed with no provenance or date. It’s described as Punti di Milano Lace – a MFA term for works with the tightly pulled mesh background, either as foreground or (as here) background, and was a gift of James William Paige, who appears to have lived up to the last quarter of the 1800s. Again, two pieces I believe were once part of the same original artifact, but with so little of whatever that artifact was, it’s hard to speculate what it might have been – bed linens, valences, curtains, table spreads, towels – there’s no way of knowing. The MFA sample came to the museum as part of the Denman Waldo Ross Collection, who collected widely in Europe and donated many artifacts to the museum in the early 1900s. The AIC piece, was given to the museum in 1969, but it’s unknown how long it was in private hands prior to that gift. It’s worth noting that Mr. Ross was part of “a prosperous Cincinnati family,” so it may not be so odd that the slightly less complete companion to the much better condition sample he gave to the MFA lingered in Ohio. 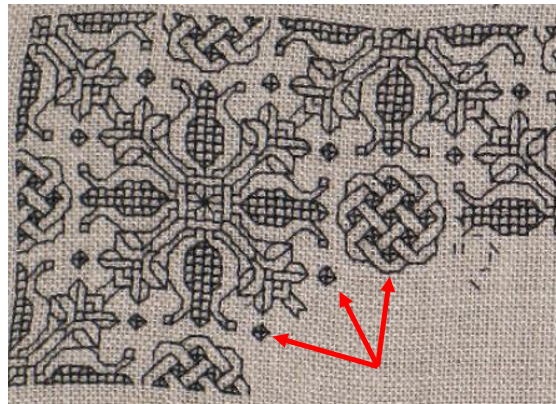 AIC calls out the working method as pulled thread work in silk, done in two-sided Italian cross stitch, plus back stitch. The MFA gives no descriptions. I’d say without seeing the reverse, back or double running, plus the tightly pulled double-sided mesh stitch are spot on. Other things to observe in this one is the method of voiding. In some pieces, it runs all the way up to the foreground motif, with no “halo” of unworked linen between design outlines and the mesh background. This is an alternative treatment, and is present on many other artifacts, too. Having done the other, I’d say this method is slightly easier because it does not perturb the outlines of the design; and many of the challenging nooks and crannies are skipped altogether. Going through my notes, what should surface, but another snippet of Elephant. This bit is undoubtedly associated with the MFA’s piece, because it was given to the Harvard Art Museum/Fogg Museum in 1916 by Mr. Ross, the same individual who donated the larger fragment to the MFA. The Harvard accession number is 1916.377, and their picture is presented below. They include no date for their entry, but agree that it is Italian. Continuing on with boring embroidery posts. A good many people will recognize this pattern. 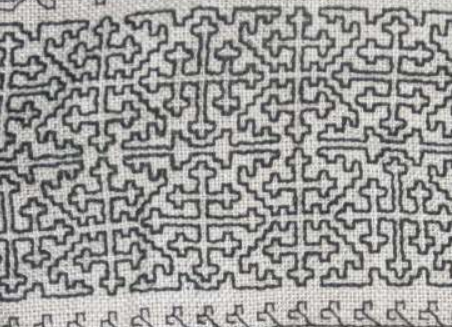 I stitched this snippet from a chart I did in TNCM (Plate 64:1). 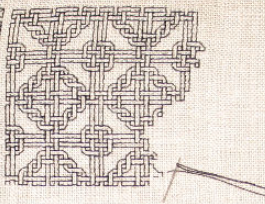 A simplified chart for the same design also exists in Pesel’s Historical Designs for Embroidery, Linen, and Cross Stitch. The original for my graph is a handkerchief in the Victoria and Albert Museum, Accession T.133-1956. It’s current attribution is circa-1600, England, although that designation has changed over time. It used to be called out as 1580-1600. I’m delighted that museums are revisiting the dates, stitch descriptions, and materials info for their smaller textile holdings. These listings are bound to improve as the methods and technologies (and available funds) to assess them improve. I do not think that Pesel used the same artifact as her base. There are some departures in her graphing from the V&A example, and her marginal notes cite a sampler source, from 1658. But look at the corners! I’ve had many people ask me about how to create corners for strapwork, to go around the perimeter of linens, or to anchor a dress yoke. Much fretting over exact matches happens. Even the choice of mitering or bending the work around the angle (as opposed to butting the design up without mating the two directions) causes anxiety. In truth all of these methods appear, although the exact mitering thing is the least commonly seen. This is one way to treat those corners. Four ways, to be exact, because no two of these corners are exact matches. And it doesn’t matter that they are not. There are three rough treatment styles. 1 and 3 are distinct, and #2 and #4 are similar but not the same. #4 has a fat twig interlace to the left of the flower, to fill in space. In #2 there was less space to fill, so that twig is smaller. The area at roughly noon above the flower is different between #2 and #4 as well. On the others, #3’s flower is squished up against the border, with no surround to its left, and all manner of arabesques fill up the extra space below the flower in #1. It’s always a matter of personal opinion and borderline heresy to use these cues to try to deduce working method, but it’s clear while our anonymous stitcher may have had a visual guide to the strip parts of her or his design, the corners were fudged in, ad hoc. The narrow companion border’s corners – both inner and outer – are improvised, too. The stitcher worked to a convenient point to form a corner, keeping it as much in pattern as possible, turned direction, worked across the top edge, turned, and so on, until the starting point was achieved – at which point the “terminal fudge” was needed to finish the work. It’s also vaguely possible that the finished size of the piece was determined in an attempt to make the the repeats (mostly) work out, rather than the square being laid out first, and the repeats being fitted into it. At least that’s the way I – an improvisational and slightly lazy stitcher – would do it. So. If you are making a historically inspired piece, do you need to meticulously draft out exact corners first, then follow your chart with fanatical purpose? Just go for it. Much as they did roughly 460 years ago. I hope I’m not boring my readers (especially my knitting pals), but with just a little bit of encouragement, I’m off and running on more historical embroidery pattern families. This one I’ve nicknamed “Oak Leaves.” It’s relatively well represented – not the design with the most extant examples, but I’ve managed to collect seven photos of artifacts displaying it, in various styles. No modelbook source (yet), and I particularly like when designs are interpreted in different ways. As in many of these smaller fragments, museum provenances and dates are not necessarily precise. Some of these artifacts have not been revisited since they were originally donated to the hosting institutions. Putting these on a specific which-came-first timeline is problematic, especially doing so based on photos alone. However, there is a possibility here again of “separated at birth” pieces, where an original artifact was cut apart by a dealer and sold to multiple collectors. I start with a piece given to the Cooper Hewitt by my idol, Marian Hague. She was an embroidery research expert and curator, who worked with several museums in the first half of the 20th century. Her work pairing extant pieces with modebook sources is legendary. The Cooper-Hewitt citation for this piece dates it as 17th century, and of Italian origin. The museum’s accession number is 1971-50-97 and was acquired as a bequest from Ms. Hague. It displays the signature elements that make up the group – the center meander, with two heavily indented “oak” leaves sprouting left and right, overlapping the meander. A central smaller floral element in the center of each of the meander’s hump, and a secondary leafy sprout filling in the hollow of the design between the leaves. This particular piece also has voided spots along the length of the center meander. Ignore minor wear and tear. The count of the leaves, voiding of the stems, method of placing and working the spots, and placement of the tendrils is the same, although some of the tendrils on the AIC sample have fallen victim to time. Therefore I opine that these two pieces may have come from the same original. That Ms. Hague’s bit is a bit more savaged is not unusual. There are other instances where she had fragments of pieces in museum collections, but usually kept the more damaged bits for her own research. The Met places it as 16th-17th century, also Italian. Its accession number there is 09.50.3806, collected in 1909. This may or may not be part of the same original as the previous two, even though it is fringed like the AIC sample. For one – it’s mirror image. That in an of itself isn’t a big difference. Photos get reversed. Designs themselves are sometimes mirror-imaged if they appear on opposite sides of a larger artifact. Tendrils are missing, but this piece appears to have undergone more wear than the other two. There are enough partial remains of the double running (or back stitch) bits to posit their existence. But while the delicate linear stitching is more prone to damage the heavier interior stitching is more durable. The little “eye” of filling, which done in the solid filling stitch and should remain – is missing. 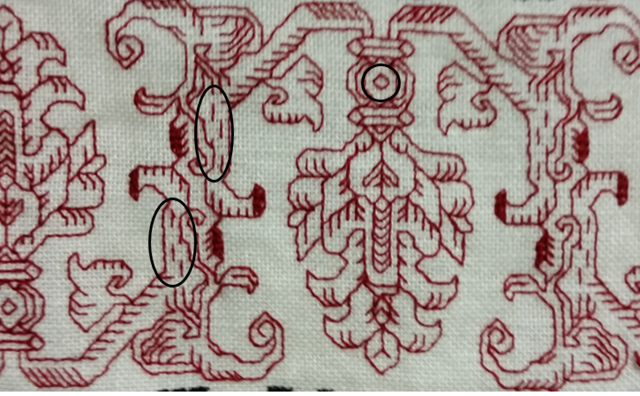 Might this be part of the same original, possibly a suite of hangings, covers/cloths or bed furnishings, but of a segment done by a less attentive stitcher? Possibly. But also possibly not, especially in light of the next example. Here’s another one with an empty “eye.” This example was found by my Stealth Apprentice, and is in the Textiles Collection of the University for the Creative Arts in Farnam. Unfortunately, the UCA gives no date or provenance for the work. Note how long this strip is, and that it’s folded – we see both sides. This might be double running and one of the double sided Italian cross stitch variants because regular long-armed cross stitch doesn’t look the same front and back. Tendrils? Check. Center meander with holes? Check. Oak leaves and supporting sprouts? Check. BUT those “eyes” – they are not worked, just as in the Met example. OK, now we go on to other design adaptations. This voided piece from the Boston Museum of Fine Arts is undoubtedly an interpretation of the same design, but with a bit more elaboration on the stems – using twining instead of spots, and on the sprouts and leaves. It’s also doubled north/south – a very common method of taking a strip design and making it more dramatic by making it wider. The MFA calls this piece out as being Italian, 16th-17th century, and names the technique used as “Punto di Milano.” (The MFA uses several stitch style names not commonly seen elsewhere, this is one.) The accession number is 83.236. I am particularly intrigued by the unworked area at the upper right. The tightly overstitched pulled mesh technique used for the background is almost impossible to pick out, and even worn, leaves a very clear perturbation of the ground weave. I know this from sad experience. Even over the centuries, I have to say that the missing bit was just never worked. Which gives us an insight into working method – defining an area, then going back and filling it in. Did this piece, in this style predate the more simplified depictions above? Again we can’t say for sure, but I tend to lean that way because the spots on the wide, plain meander to me look like the simplified descendants of the voids formed by twining stems in the MFA’s example. One person’s opinion – feel free to disagree. The Met lists this one as being Italian or Greek, from the 16th-17th century. It was acquired in 1909, and its accession number is 09.50.58. This piece is my favorite of the set, both for the delicacy of the interlace and the squared ground. Obviously the tendrils are gone, as in the other voided interpretation, but it’s the same oak leaf design for sure. And did you catch the mistake? Upper right, where the meander is cut off from joining the previous repeat. That’s not wear and tear – that’s a place where stitching happened where it doesn’t appear in subsequent repeats. And last, but not least, a pattern cousin. This one was also found by the Stealth Apprentice. 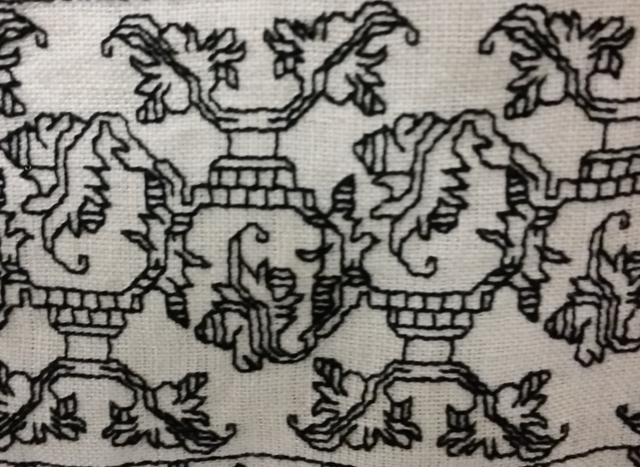 This is an Italian towel or napkin, claimed as 16th century, in the Marcus Jehn private collection. The only link I have for it is to the collector’s Pinterest board. This is a curious piece. 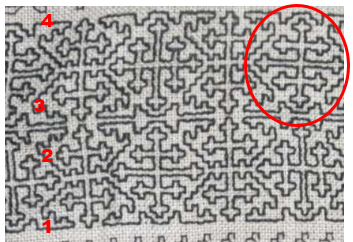 It’s clearly derived from the same pattern family, interpreted in a linear stitch. But the interlaces of the meander are rather heavy compared to the delicacy of the Met square-voided sample, above. The slightly fudged corner is also of interest. If I had to guess, I’d suspect that this piece was a see-me-and-copy, derived from something that looked more like the two voided examples. So, what have we seen here? Mostly that there are design clusters that are clearly related. That there is no one canonical way in which to use these patterns – interpretations, some only a bit different, and others quite divergent, vary from artifact to artifact, even among those done in the same technique. And based on museum citations alone there’s no clear way to arrange them in parent-child relationships other than idle musing. Most of all, I like that there is no one “right” way to stitch these designs, and that when I do my own variant, I’m adding to family that stretches back for hundreds of years. And another one of the same family surfaces! This one is the largest departure to date in terms of style, but it is clearly descended from the same pattern lineage. Meet the Metropolitan Museum of Art’s holding #09.50.65 – entitled “Fragment,” dated to the 16th or 17th century, from Italy or Greece; added to the museum’s collection in 1909. This one is from the Victoria and Albert Museum. It’s one piece of a composed group of borrders, displayed together. The entire group is attributed to 17th century Italy, and is cataloged together as museum number T.114-1930. This one is sort of half-way between the versions with the heavy, abstract main trunk at the top of the page and the Met example with the squared ground. In this “missing link” you can see where the lozenge spots on the most abstract versions come from, while it still retains the coiled smaller branches of the most detailed example. To complicate matters further, there is the fragment below, from the Met, accession 79.1.294, also sourced to 17th century Italy – Sicily in specific. Although the museum calls it a border, I don’t think it started out as one. The bottom edge is nice and neat, with a defined stitched edge, but the top piece is ragged – cut from a larger design. Now look at the V&A piece above and image it doubled, with two strips stacked one on top of another. (Doubling pattern strips this way was a very common method of achieving a deeper design.) In your thought experiment, now “cut” a section where the leaves are facing each other. Not only is this totally plausible as a strip cut off of a wider design based on our leafy friend, but the similarities to the Met’s strip are unmistakable. Again, we can prove nothing without artifact forensics on the ground and stitching thread, but I would not be surprised to find that these came from different stitched sections of the same original piece – possibly from a side strip and a wider decorated end of a towel or other cover. WHEN IS MORE OF THE SAME NOT MORE OF THE SAME? Another post that only a stitching history nerd will love. One reprinted in 1886 as Kreuzstich- Muster: 36 Tafeln des Ausgabe, 1604, that calls out Siebmacher as its author. Many of the designs in these books seem to repeat edition to edition. Some are unique to only one. Before we begin, it’s worth remembering that these books are survivals. Long use and reuse over decades have resulted in page loss. None of the editions are complete, as in “all intact in one original binding,” and some may have been re-composed at a later date from other partial works. But we do what we can with what we have, and Siebmacher’s editions have title pages in them, and distinctive numbering and framing conventions that can lead to a reasonable conclusion that they were from the same printing workshop. All of the books show graphed designs suited for reproduction using several techniques, including various styles of voided work on the count, lacis (darned knotted net), and buratto (darned woven mesh). Twp of them also include patterns that would be suitable for other forms of lace. Over time these patterns went on to be executed in weaving, cross stitch, filet crochet, and knitting, too. The descendants of these designs ended up in multiple folk traditions and samplers on both sides of the Atlantic. In addition to the longevity of their contents, Sibmachers books are among the earliest that seem to indicate execution of the design using more than one color or texture, a feature not common in the black-and-white printed early modelbooks. Here are examples the first two books. But I don’t think that these pages were originally printed two-tone. I think they were hand-colored to add the darker squares, either at the time of manufacture or later. Obviously, the two samples above were printed from the same block. But the pattern of the darker squares is different, and if you look closely, the some of the solid squares looked colored in, as opposed to having been originally printed that way. I can say the retoucher who did the 1597 was a bit neater. I don’t think these were colored by the book buyer, because every single edition of Siebmacher’s works that I’ve seen have included multi-tone pages like this. The brown ink on the G near the talon matches the color of the hand-drawn designs at the back of the book – post-publication additions. But these books are not the same. A very familiar stag, that shows up on some of the earliest samplers, with descendants on American Colonial samplers, all the way up to pieces done in the 1800s. Similar, yet not the same. All this aside, even the seemingly close 1597 and possibly-1611 versions have significant differences between them, although they do have exact page duplicates between them. Not so with 1604 – it’s unique when closely compared to the other two, even though all three have the same author attribution, and very similar styles. This is VERY odd considering the vast amount of physical labor that had to go into producing these blocks. So. What’s going on with the 1604 edition? Why is it so different from the other two? Has anyone read an academic work that examines this issue in more detail, or corroborates these findings with other editions that are not published on line? So many patterns, so many questions, so little time to do in depth research. Early stitching modelbooks. They so often look the same, page after page. Where did I see that design before? Why is it oh, so familiar? And so we launch again into a post that only a stitching geek would love. Early European modelbooks produced by sixteenth century printers in Italy, Germany and France often include similar patterns. Often the same patterns. Sometimes patterns SO much alike that one would think they were printed from the same blocks. In some cases, especially if one printer did successive editions of work, that’s entirely likely. In other cases, where the same block appears in works from different shops – that’s not entirely clear. Especially if the workshops of the various printers were separated by geography and/or time. However it happened – trade in blocks, plagiarism from printed copy, whatever – it is clear that considerable cross-pollination did occur. 1530/31, Italy is pretty early, right? Well, there’s this. Johann Schonsperger the Younger, from 1529, published in Augsberg, Germany This is from Ein new getruckt model Buchli auf außnehen, vnnd bortten wircken..., in the collection of the Staatliche Museen zu Berlin, #0S-1473-kl, as presented via Bildindex. Not surprisingly, Johann Schonsperger’s earlier work, Ein new Modelbuch auff auaußnehen vnd bortern wircken.. from 1526 (also from Augsberg) has the exact same page. Also from Staatliche Museen zu Berlin, #0S-1472, as presented via Bildindex. So we’ve traced this panel back to a 1526 edition, published in Germany. But were all of these printed from the same blocks? I’d say that the two Schonsperger pages were certainly produced from the same blocks. They have the same curious features and mistakes. Yup. The little crescent is missing, and the lower arm of the fleur-de-lis type detail with the clumsy header is gone entirely – the design is truncated, leaving it on the cutting room floor. There are other differences – mistakes made in one version of the design but not in the other, that you would only notice if you were trying to redraft or stitch from each pattern. And the Schonsperger plate makes another appearance! This time in Anton Woensam’s Ein new kunstlich Modelbůch, published in 1536, in Köln. 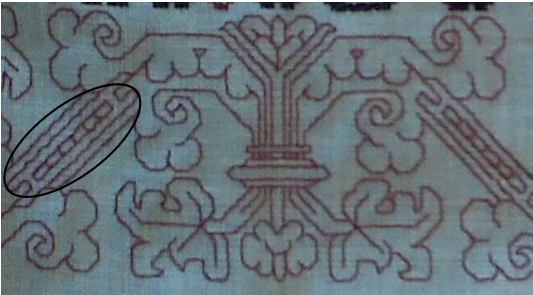 Based on private notes of inquiry and discussions on various historical needlework-related boards and forums of late, I see that people are still confused about the working logic of linear stitching. In specific, how to determine if a design can be worked entirely two-sided. First off – the two most popular historical methods for working thin linear designs are double running stitch and back stitch. The big difference between the two is the appearance of the reverse. Done meticulously, with care paid to invisibly terminating threads, double running stitch is almost indistinguishable front and back. Almost because a few people do produce a slight difference due to differential thread tension on each of the two passes required to produce a unbroken line, but that difference mostly settles out over time. Back stitch on the other hand produces a public side very much like double running, but the reverse of the work is heaver, and depending on the stitcher can look like outline or stem stitch, or even like a split or chain stitch if the needle pierces the previous stitch as a new one is made. Of necessity in back stitch there is twice as much thread on the back of the work as there is on the front. Looks the same as double running on the front (top), but different on the reverse. Double running stitch takes two passes to accomplish because it first lays down a dashed line, with the spaces between the dashes being filled in on the second pass. A back stitch line is completed in one pass, with no need to revisit areas previously stitched to complete the line. Many people prefer back stitch because there IS no going back. They like the certainty of knowing exactly where they are at all times, over the pretzel logic of calculating how not to be caught in a cul de sac while retracing steps in double running. Personally, I prefer double running, and follow double running logic even if the piece I am working will not be seen on both sides. I find that path planning to be fun, and I appreciate thread economy, especially when working with more costly or difficult to source hand-dyed silks. But for some one challenge of double running is knowing which designs can be worked in that stitch such that both sides can be made totally identical. It’s easy. Any design that has no “floating elements” is a prime candidate. If true double sided is a total goal (including invisible termination of thread ends), any piece that has a floating element large enough to allow that burial is also a possibility. It doesn’t matter how complex a design is, so long as elements are all branches and detours off of one or more main baselines, they can be stitched double sided. And yes – there CAN be more than one baseline in a design. More on baseline identification is here. The logic of following detours and returning to the baseline is here. How to break up a large design into several smaller baselines is here. That’s easy. They are any ornament or detail that is discontinuous from the main line of the design. Here are several that I’ve done in double running, based on one or more continuous baselines, with no floating element deviations. In these designs every part of every work is attached to every other part, at one or more points. 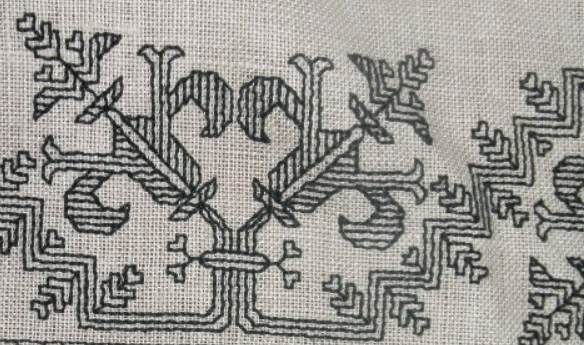 The last one has additional embellishment in long-armed cross stitch, and the final one includes two edge borders, each done as their own “line” separate from the main motif. By contrast, here are several that have those “floating elements” called out. The knot element in the all-over at left is not attached to the main pomegranate frame. It is however just large enough manage thread-end-hiding. So while its presence makes this a tedious and difficult pattern for double-sided double running stitch, it is not a deal breaker. However those little accent diamonds are deal breakers. Too small to hide the ends, and detached from the main design. The ladder element in the arms of the repeat at right is broken from the main design, and is too small for end-camouflage. My dragonbeast, however lovely, has quite a few floating elements, making him a problematic choice for a fully double-sided work. (Eyes and faces are almost always difficult). And this bit, stitched from a Lipperheide book, is the absolute poster child for discontinuity. I didn’t mark them all, but you get the idea. The spaniel and possibly that center bundle thing are the only bits large enough in which to bury the ends, if a fully two-sided result is desired. Here’s a tricky one. Look closely at the bit on the left. It looks continuous, but it’s not. There are in fact FOUR separate double-running baselines, AND a discontinuous element in the motif. He’s in the red circle on the right. Like the round knot in the first example this might be done double sided, provided that the stitcher was willing to terminate separate ends for that relatively large floating element. So in short – it doesn’t matter how complex a design is, so long as all elements are continuous it CAN be stitched fully double sided, in double running stitch. Based on questions from Elaine and others, here’s a bit more on the thread I’ve been using on both the Permissions and Trifles samplers. The name brand is Cifonda Art Silk. It’s not a spooled rayon intended for machine embroidery. As you can see, the put-up is more like cotton embroidery floss. And it turns out that the stuff is still being made, and is available in Australia, and even in the US – although mostly by special order. The websites that offer this thread vary a bit in description. Some say it is a 35% silk/65% rayon blend. Others say it is all rayon. 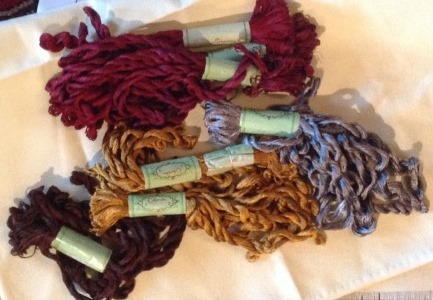 Contemporary put-ups specify 8 meter skeins. My vintage stash skeins are a bit longer, possibly 10 meters (I’ll measure tonight). The large bundles above are actually “super-packages” of ten individual skeins. You can see the bright red one at the left is broken open, with the single skein labels showing. On mine, color numbers are written on each skein by hand, not printed. There can be hue variances between the super-packages of the same color number, so I suspect that special care should be taken to buy all that’s needed at once, so that all is from the same dye lot. Cifonda’s structure is that of standard floss – six strands of two-ply relatively loose twist. 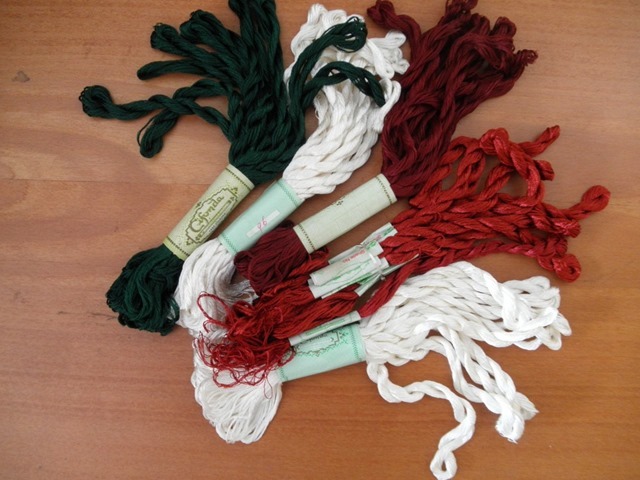 The individual strands are quite fine, two of them are roughly the equivalent of one ply of standard DMC cotton embroidery floss. The colors – especially deeper ones like red and indigo – do run when wet, although they do not crock (shed color on hands, ground cloth, or wax when stitching dry). I would not advise using this thread on clothing, table linen or other things likely to need laundering. It may be possible to set the colors before stitching using a mordant bath or long water soak, but I don’t have the experience, time, or materials quantity for experimentation. I am pleased with the way the Cifonda looks in my work. It’s a bit shinier and finer textured than cotton floss, although it does not have the coverage of the true silk floss I’ve used (Soie d’Alger). My Cifonda is quite slippery. Two or more plies held together tend to disassociate and slide past each other for differential consumption, even when using short lengths in a small-hole needle. I tamed this by aggressive waxing – running the entire length of my threads over a block of beeswax before use. Since I’m doing linear counted work, any change in color or texture is not noticeable. Someone using this for satin stitch, long-and-short, or other surface stitches that maximize thread sheen would probably want to wax only the inch or so that threads through the needle. Like all lightly twisted rayons, this thread does catch and shred a bit on rough skin. Care must be taken to use needles with very smooth eyes, and to hold the unworked length out of the way when taking stitches, because the stuff snags extremely easily. My own stash, well aged as it is, contains some colors that are a bit brittle. The bright yellow I’m using now, and the silver-grey I used on the last sampler are both prone to breaking under stress, and must be used in shorter lengths than the other colors. I will continue to use up my India-souvenir thread stash, working smaller and smaller projects until it is gone. But in all probability, I will not seek out the Cifonda to replace that inventory as it is consumed. Anyone else have experience or hints on using this rather unruly stuff?